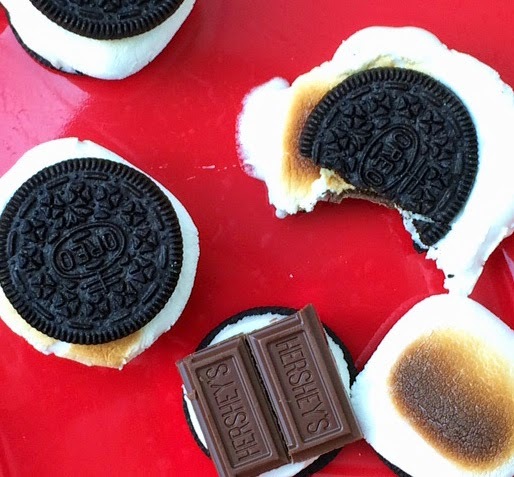 We are eternally on the hunt for the best s'more combinations. Don't get me wrong, the traditional combination of graham cracker, chocolate, and marshmallow is pretty perfect, but you can spend an entire summer finding fun ways to recreate this iconic combination. Lasts nights version came from my husband who sent me text messages at the stores letting me know I needed to bring home Oreo cookies. I thought it was just so we could dunk them in milk, but I soon learned it was for a S'moreo. We have been discussing a fire pit in our back yard for a while, but I have to admit that most of our s'mores are made indoors. You can make s'mores in a microwave by microwaving the marshmallows for about 15 seconds. If you watch them, they will puff up and then start to melt. You want to stop the microwave as soon as they stop growing. The only issue with the microwave is you don't get the toasting and therefore you lose the yummy flavor that comes from caramelization. So put some parchment paper on a cookie sheet, lay your marshmallows flat, and put them under the broiler. You will know when they are done because you will see them start to brown and you will be able to smell the yummy toasted marshmallow scent. This looks like a great thing for my choc. crazies. Great idea! Saw one for brownies but love the idea of using Oreos... Great blog!